Willow oak (Quercus phellos) leaf. Willow oak is a medium to large tree with a dense, pyramidal crown (becoming more rounded with age) and straight, clear trunk. Leaves are alternate, simple, 2–5 inches long, to 1 inch wide, shaped like willow leaves, narrow, gradually tapering at both ends, thick; margin entire, bristle-tipped. Leaves turn pale yellow in fall. Bark is smooth, light reddish-brown on young trees; dark gray with rough, irregular, scale-covered plates and shallow grooves when older. Twigs are slender, reddish-brown and hairy; gray and smooth with age. Fruits September–October, acorns solitary or in pairs; nut brown with dark stripes, rounded, about ½ inch long; cup covering about ¼ of the nut, saucer-shaped, shallow; scales small, flattened, greenish- to reddish-brown, finely hairy; seed bitter; ripen in autumn of the second year. Similar species: Shingle oak (Q. imbricaria) has wider leaves and deeper acorn cups; it is also more widely distributed in Missouri. Willow oak is a type of oak and is not at all a willow; it was named for its willow-like leaves. Willow oak leaves are narrow and taper at both ends; they look a lot like willow leaves. The nuts of willow oak acorns are brown when mature, with dark stripes, and are rounded, about ½ inch long. The cup covers about ¼ of the nut. Willow oak (Quercus phellos) acorn. Occurs in poorly drained soils, in wet bottomland forests bordering swamps and slow streams in the southeastern Missouri lowlands. May do well when planted as ornamental throughout Missouri. This species is uncommon in Missouri due to loss of habitat in the southeastern lowlands. Restricted to southeast Missouri. 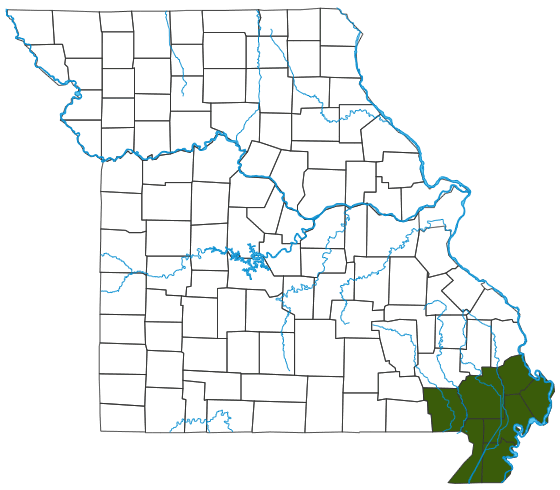 The native range of this plant extends to the south and southeast of our state, and the Missouri Bootheel represents a northwestern extreme of its range. Willow oak belongs to the red oak/black oak section of oak trees; its membership in that group can be seen in the bristle-tipped leaves and bitter acorns that mature in their second (not first) autumn. Because it takes two growing seasons for an acorn to mature, oaks in this group always have some tiny, immature acorns on their branches in wintertime. A popular ornamental tree in the southern United States, known for its rapid growth, long life, and handsome shape. The lumber has many uses, and like most oaks, the bark was used medicinally, as an astringent tea, by Native Americans. The acorns are eaten by songbirds, woodpeckers, ducks (especially mallard and wood duck), wild turkey, bobwhite, mice, squirrels, raccoon, and white-tailed deer. Missouri's southeastern lowland forests are a unique and interesting part of our state, and this species is a part of that habitat.